The gold price recently burst through the $US1300 ($A1750) mark, once again attracting the eye of investors who are starting to scan the gold landscape for opportunities. 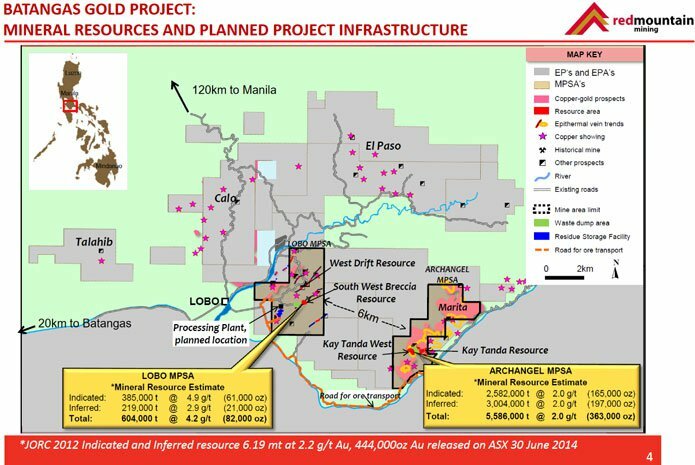 What could turn out to be one of the more opportune prospects on the market right now is Red Mountain Mining (ASX:RMX), which has recently wrapped up a Pre-Feasibility Study on its flagship Batangas Gold Project in the Philippines. The micro capped RMX (capped at around $3 million) has managed to work the numbers and along with its JV partner with whom it shares the Project on a 75/25 basis, plans to grab hold of a potential free-cash flow of $46 million in the first seven years of the project. The PFS offers one of the first robust looks of what sort of return the project may generate for the company – and everything’s starting to line up. The Batangas Gold Project has a maiden open-pit Ore Reserve of 128,000 oz. of gold, including a high grade 100,000oz at 4.2 g/t gold. It has a production forecast of 116,000 oz. of gold, an increase of 26,000 oz. of gold from the Scoping Study. It has low cash operating costs, low up front capital, an additional 320,000 oz. of gold in majority Inferred Resources available for future conversion. 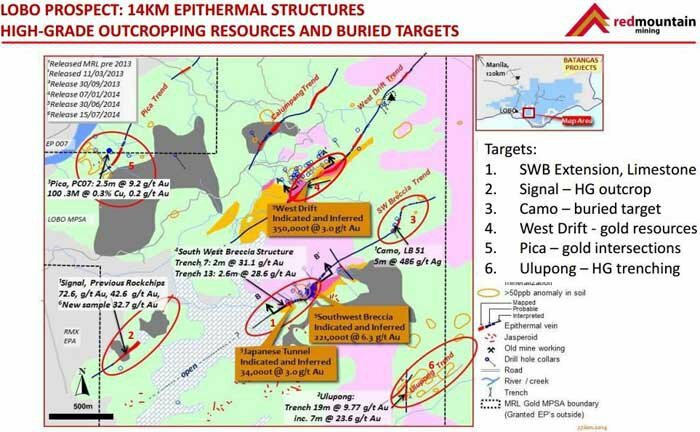 There is immediate upside potential in the form of identified exploration targets, that have already generated exceptional rock chip grades at surface. Based on the results from the PFS, showing a potential low cost, viable Batangas Gold Project development, RMX and its project partner will seek to complete additional technical work as it heads towards a Definitive Feasibility Study (DFS). Before we go too far, it should be noted that for political and social reasons, this is a very high-risk stock. Getting mining projects up and running in countries such as the Philippines is no simple feat, and there may be challenges ahead. To fund the additional technical work required to finalise the DFS, RMX has received firm commitments from sophisticated and professional investors to raise $275,000 (before costs), via the issue of 275 million shares at an issue price of 0.1 cents per share. For every two shares issued under placement, RMX will also issue one new listed option exercisable at 0.15 cents each which will expire on 31 March 2018. In parallel to this, the Joint Venture will seek to complete all final permitting and approvals to allow development of the project. In this article we’ll take you through the company, the pertinent points to its PFS, its exploration chops and tell you why RMX might be finally in a position to start to fulfil its potential. Possible New Gold System on the Cards for RMX? As you can see below, the project is made up on two main resource areas – Lobo and Archangel . Both areas have gold at surface, so the simplest way to differentiate the two is that Lobo is high-grade and in steep structures, while Archangel is lower-grade but flat lying. As we’ll get into later, this makes Lobo the obvious candidate for first-up production. 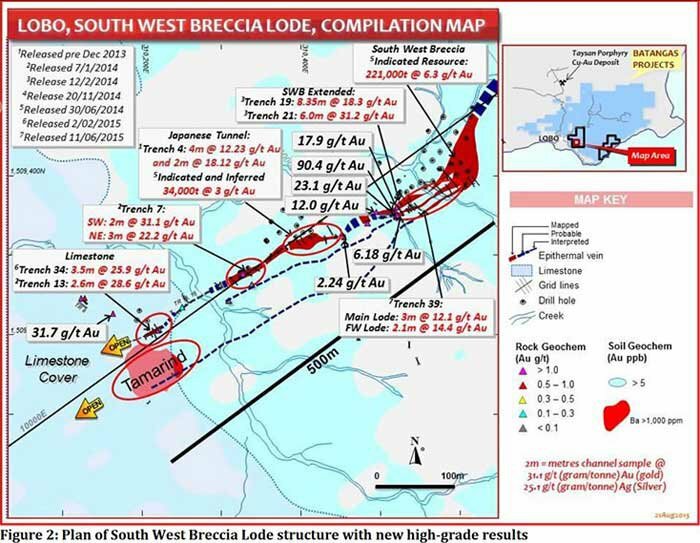 The very latest figures from the company suggest Lobo has indicated and inferred resources of 604,000 tonnes at an average grade of 4.2 grams per tonne, including the very high-grade South West Breccia and Japanese Tunnel zones with indicated and inferred resources of 221,000 tonnes at an average grade of 6.3 g/t Au, from surface. High-grade gold is the main game here, and the best grades are at surface. Meanwhile Archangel has indicated and inferred resources of 5,586,000 tonnes of gold ore at an average grade of 2 g/t gold and 3.3 g/t silver. While there is still much work to do to make this project a mine, this PFS is already looking pretty good for RMX. This is the culmination of over 18 months of work for the company, and it shows. RMX has managed to pull out a plan which could generate $A46 million in free cash flow to the project partners in the first seven years of operations, after all capital expenditure is repaid. RMX currently (at the time of writing) has a tiny market cap of under $3 million. 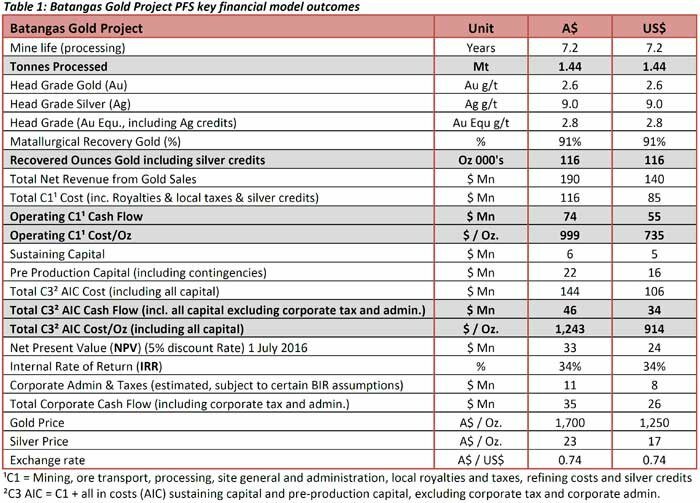 By 2.2 years, the Batangas Gold Project should be able to pay back upfront capital costs. The PFS confirmed operating costs of $US735 ($A999) per ounce – which takes into account silver credits against the all-in cash costs of $US 914/oz. ($A 1,243/oz.). Whichever number you take into account, it’s looking pretty good for RMX. Gold-watchers will know that the gold market recently hit an almost two-year high . Last week prices hit $US 1319/oz. – or nearly $A 1,800/oz. Now, just consider that for a moment. RMX is still a while off from production and the price of gold can fluctuate, so there is no guarantee it will stay this way – but it bears some thinking about. 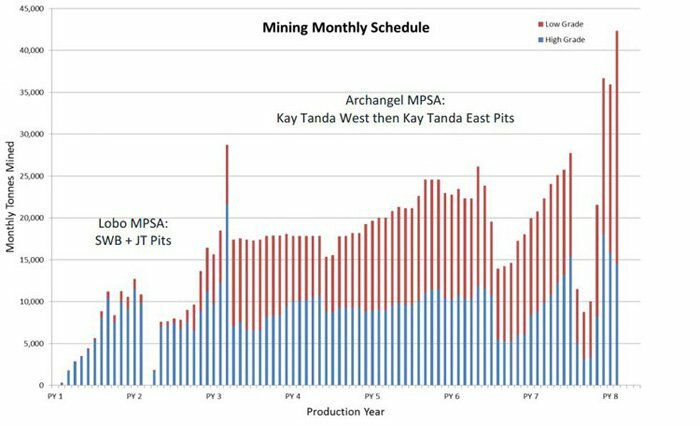 The operation at this early stage, when cost improvements are still in the pipeline, has all-in cash costs margin of over $US 400/oz. or >$A 550/oz . – demonstrating how well this project stacks up. Here’s a closer look at the numbers. As you can see, RMX and its JV partner are hoping to mine recover 116,000 ounces of gold, with silver credits, over an initial 7 year period. Now, if you take the margin at that two week-high gold price of $A550/oz., and multiply that by 116,000oz you get a figure over $A 63 million over seven years, another $A17 million above the cash flow in the PFS at $A1700/oz. Please note that these are estimates only and things can change between now and production – so best not to take this as absolute gospel at this stage, the company still needs to complete its Definitive Feasibility Study (DFS). Don’t take these figures as the sole reason for your investment decision. With a PFS statement you can slice and dice the numbers however you want – but it’s worth taking a look at the mining plan to see how RMX thinks this one will play out. At this stage, RMX has an up-front capital cost of $A22 million factored into the equation – and that will buy the Project a brand new CIL (carbon in leach) processing plant as well as all the infrastructure required to establish the mine. The way RMX wants to go about mining is one we’ve seen from a few juniors before, and we think it’s a very smart play for a capital constrained company. What RMX wants to do in the initial years of the plant’s operation is mine and process ore from the high-grade South West Breccia and Japanese Tunnel open pits at Lobo. This is where the mineralisation is right at the surface – and has a very high grade. We’re talking an average grade of 6.6 grams per tonne of gold here, with surface results in trenches including 7 metres at 20.5 g/t gold and 6 metres at 31.2 g/t gold, or over 1 oz of gold per tonne. So with this ore, you’re getting the most bang for your buck while keeping mining and processing costs per ounce to a minimum. This ore here is a lower grade at an average grade of 2.2g/t, but is easier to mine and process. So at this stage the plan is to transport 250,000 tonnes of ore per year to the CIL Plant (which will be based at Lobo). It’s a smart way to get maximum value from the initial years and pay back any debt the company may take on board to get the project up and running as quickly as possible. The company managed to put out a bit of an update on that as well along with the PFS. Well, the update is mostly that it now has an ore reserve – anyhow. Before this point in time the company had a mineral resource, but as the project moves forward this has been put into an ore reserve – or the amount of mineral resource within the mining areas. The total probable ore reserve, which was based on indicated resources, is 1.44Mt @ 2.6g/t Au, with a silver kicker of 9 g/t Ag, or by taking into account any silver credits (the amount of silver it can sell from the project along with the gold), the average gold-equivalent grade becomes 2.8 g/t. This turns into 128,000 ounces of gold contained with silver credits, before being processed to recover 116,000 ounces of gold with silver credits. Of course, this is just the start of proceedings, with RMX able to go forward with these numbers but knowing that there’s probably a lot more to come. Remember, Lobo is the high-grade prospect – meaning anything RMX is able to bring up from exploration is likely to be high-grade in nature – based from the previous Lobo experience. When you consider that RMX has previously stated that only 1 kilometre of those 14 kilometres has been seriously tested, with, inferred and indicated resources at Lobo currently at 82,000oz grading 4.2 g/t gold – it means that RMX may be able to add to its reserves position at the high-grade Lobo prospect many times over. SWB is the main game at Lobo for RMX, and this is where the bulk of its current resource and reserve comes from. In September last year RMX told its shareholders that it has effectively firmed up a 40m strike length extension . Chip sampling and trenching from that extension brought up hits including 7m @ 20.5 g/t Au, 7m @ 11.5 g/t , and even a hit of 151.6 g/t . You can see why this is worthy of follow-up drilling. As far at The Next Small Cap is aware, this resource hasn’t made it into the book as yet – so worth keeping an eye on. Meanwhile, it’s looking at another SWB-sized target. SWB is the main game for RMX, so what would happen if it essentially found another one ? That’s what RMX is thinking about with Tamarind, and investors will be hoping this turns out as compelling. Tamarind is on the bottom-left of the image above – and while it’s still early days the high-grade gold trend remains open, meaning that there could be more to come yet. The main driver here has been soil anomalies so far, but a trenching hit of 3.5m @ 25.9g/t and a rock chip of 31.7g/t has been brought up as well. This is just speculation on our part, but we may end up seeing a bit of this in a future DFS. So, RMX clearly has the plan at this early stage to create a project with some pretty bullish free cash flow numbers – particularly impressive for a company of its size. As any mining investor will tell you though, you need more than a plan to bring the whole thing together. We’ve written about this before, but its deal with Bluebird Merchant Ventures is a key ingredient in the whole thing flying. You can read about the background on the deal here , but we’ll give you the short version. Basically, RMX’s JV partner at the project, Bluebird Merchant Ventures recently listed on the main London Stock Exchange, which has unlocked additional cash for the Project. $US1.7 million ($A2.3 million) of that cash has made its way to RMX (partly in Bluebird shares) in exchange for 25% of the project – which incidentally values the project at about $A9.4 million. One of the wildcards with RMX is that it obviously needs to get all the regulatory and permitting approvals in place in the Philippines – a place which can be challenging to operate in if you don’t know what’s going on. Those of you watching RMX would know that it’s taking a fair while for it to get its permits in place – and in fact it hasn’t managed to pull that feat off yet. There is a fairly good reason for that though: the Philippines general election. Recently, the Philippines went through a general election – meaning that all levels of government from city councils right up to the national government were up for election. 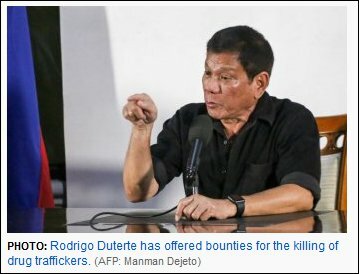 If you haven’t been keeping abreast of Philippine politics (we don’t blame you), the country recently elected the tough-talking Rodrigo Duterte as its president – although he hasn’t officially taken office yet. As a side note, this is a guy quite...determined to stamp out crime. “Forget the laws on human rights. If I make it to the presidential palace, I will do just what I did as mayor. You drug pushers, hold-up men and do-nothings, you better go out. Because I’d kill you,” he was quoted by the BBC as saying during the campaign . But he was also quoted as saying “...if you can follow the Australian standard of taking care of the mining area... If you can follow the Australian standard of mining, I will allow it,” he told reporters at ABS CBN on the 26 th of May this year. But of even more relevance to RMX, the local elections also took place at around the same time. That means permitting processes tend to get thrown up in the air while local councils focus on re-election rather than future projects such as gold mines. The services will keep on running, but a lot more time will be dedicated to campaign posters rather than permitting paperwork. With the local elections all but over now and the new council in place after 1 July, RMX should find permitting a lot easier – keep your eyes out for news regarding permitting. The final thing you need to succeed at any company is a highly experienced board – and RMX has a board which has actually seen projects through before, which tends to be pretty important. 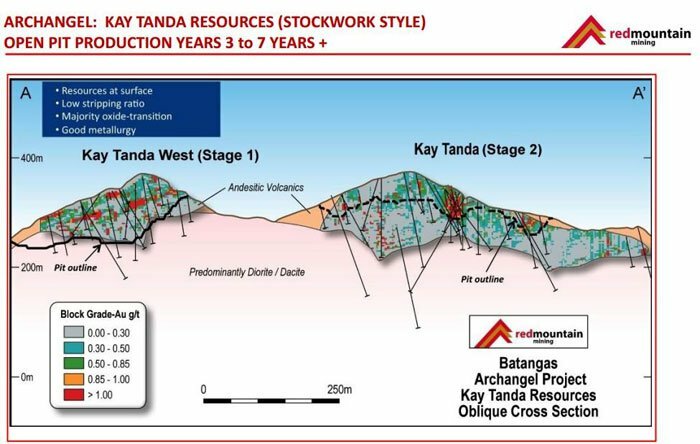 Dugdale has been at the helm since 2013, and interestingly was president at CEO at Mindoro Resources – the company from which RMX acquired the Batangas project. That means he’s followed the project from company to company. He’s also literally an award-winning exploratory geologist – having jointly won the Joe Harmes Medal for excellence in mineral exploration and contributions to the discovery of ore assets. He won the award during his 20-odd years with Western Mining Corporation, and then MPI Mines. At MPI mines, he was involved with the one million ounce Golden Gift discovery at Stawell – which is what he won the award for. Until 2012, Warburton was the CEO of Barminco Limited – one of Australia’s shining mining contractor lights. During his reign, revenue at the company doubled on the back of his guidance in Australia and Africa. So clearly he’s a guy who knows about the nuts and bolts of mining and isn’t just stuck in a spreadsheet all day. Mr Wolley is currently a senior executive with Todd Corporation and was recently the managing director of gold development business Golden Iron Resources. He has also served as COO at Lynas Corporation – so he’d be well aware of operating conditions in south-east Asia. He’s also been a managing director for Asia Pacific for a refrigeration and climate control business, and president of BlueScope Steel in China. Clearly this is a guy who knows how to operate in the Asian region, and all in all, a board who knows how to find and develop gold mines! RMX and its shareholders will tell you that it’s been a long road to get to this point, and there is still some distance to travel. However, it now has the game-plan, the cash, and the experience in place to bring the project to fruition. 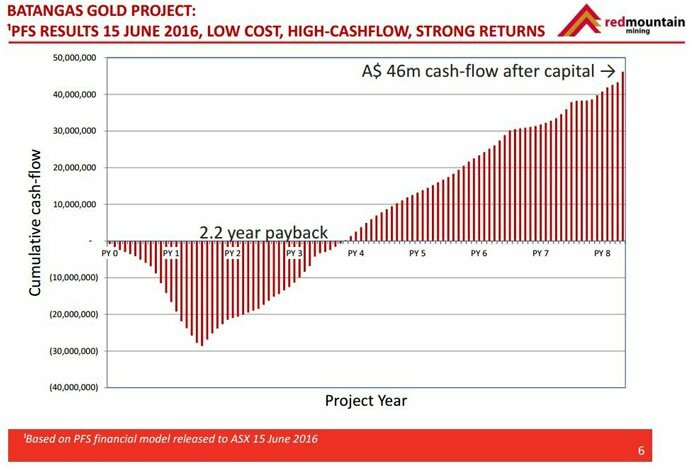 RMX has managed to demonstrate it has a project which will generate $A46 million in free cash flow over seven years, at a gold price lower than it is today – and that’s at the PFS phase with potential to build the gold reserves further before the DFS is completed. As we’ve been at pains to point out, these are early days yet in the development of the project, so seek professional advice when considering this stock for your portfolio. The expectation for RMX is that there are further efficiencies and many years of exploration to come. 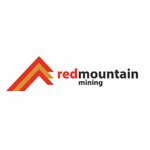 We’ve been watching RMX for a fair while now and it has been a slow burn – but now it feels like all the hardest yards have been run and the hurdles in the story have been cleared, so it should be smooth(er) sailing from here to gold mine development – and the rewards should hopefully be worth it! Lithium Brine Drilling Any Day Now: Is Cobalt Next for RMX?